UPDATED: Thu., June 28, 2018, 5:48 p.m.
Miguel Aparicio, the Texas Rangers No. 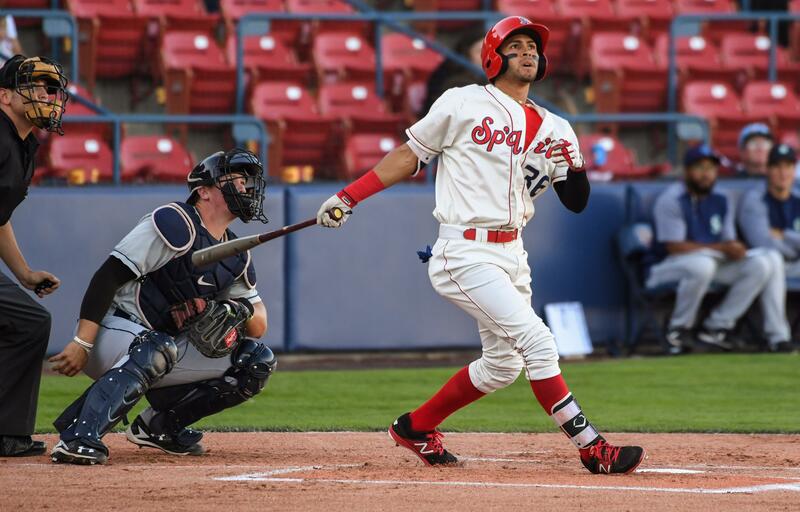 17-rated prospect by MLB.com, was promoted from the Short-A Spokane Indians to the Low-A Hickory Crawdads, a team spokesman confirmed on Wednesday. Aparicio batted .244/,250/.333 with one home run and four RBIs in 11 games and 45 plate appearances for the Indians this season. He started the season in Hickory, batting .208/.270/.312 with two homers and 12 RBIs in 31 games. O’Banion hit .191/.268/.264 with one homer and nine RBIs in 31 games with Hickory and .188/.235/.188 in four games with Double-A Frisco earlier this season. He spent all of 2017 with the Indians and hit .250/.338/.431 with five home runs and 24 RBIs in 54 games last season. Published: June 27, 2018, 10:49 p.m. Updated: June 28, 2018, 5:48 p.m.